I looked at this photo for about 30 minutes, and it looked like a very cute puppy dog. I then thought about how many different types of animals that this could be. I then notice that the bottom frame shows us that this trail cam has all the bells and whistles on it. The time date year the temperature and the phase of the moon. There is only a sliver of a moon and its 47 degrees out.and perhaps it’s a cloudy night. But this camera should take a picture at a range of 75 feet. Yet we can’t seem to make out the trees in the background or even see the ground in front of the camera leaving the whole right side of the picture in blackness. After the picture is taken then you can zoom in or move the picture left and right. So, I guess shaw is right when he said that he would have to have the S.D.card to analyze the picture. Now for the easy part, there is no face nor is there an eye in this picture. So now just put your finger over what appears to be the eye and what do you see? 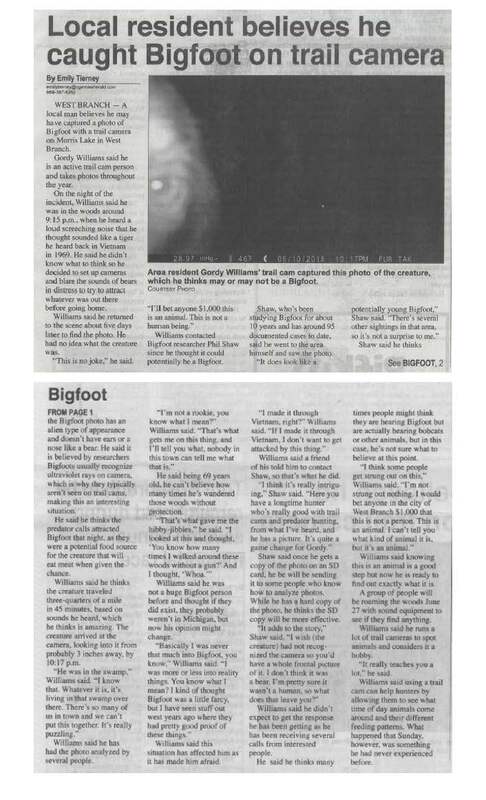 Well, now we clearly see a bigfoot, or maybe just a big naked man or woman. But the head of the creature is out of frame. also now it appears to be about 7 feet away from the camera. and no doubt this thing looks huge. What could it be?so now you can tell that there is no eye in the picture there isn’t even a head. What appears to be the eye is only the reflection of the inferred flash. Now by keeping your finger over the eye and slightly moving your finger up and down. and looking below your finger you will notice what appears to be a thumbnail. But now the hard part. Can you twist your thumb in such a way that your thumb seems to be sideways like in the picture? I cant. So the bottom line here is that I guess we would need the S.D. card. Or what I mean to say is that I guess I won’t be collecting a thousand dollars any too soon. Oh well, it is truly a very interesting picture. Thank you for your comments. I appreciate your feed back. Please keep following our website.